Size:TWIN(74"x37.5") Size:TWIN(74"x37.5") OPEN-CELL MEMORY FOAM Hypoallergenic memory foam keeps you cool and adds just the right bounce RESPONSIVE MEMORY FOAM High-quality memory foam provides pressure relief POLYESTER PONGEE COVER Made from premium polyester pongee, the cover is breathable, flexible, and resilient. SAVE YOUR CURRENT MATTRESS Enhance your mattress with Cr Ventilated Gel-infused memory foam mattress topper! The 3" thick topper is perfectly designed to be placed right on top of your current mattress for an added comfort layer. This topper will increase the quality of sleep from your mattress immediately. The topper surface is universally comfortable - it contours to your body to relieve pressure while retaining a healthy bounce and cool temperature. 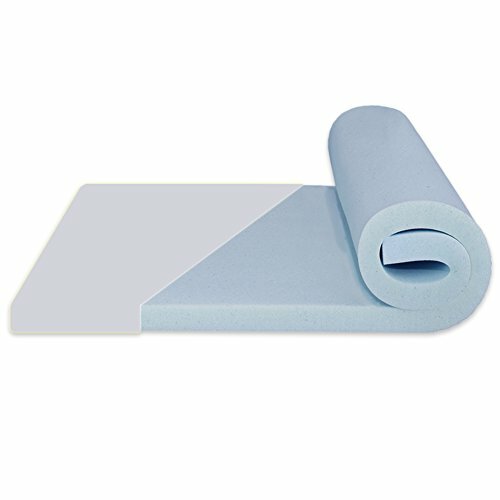 CERTIFIED SAFETY The foam used in this mattress topper is CertiPUR-US certified, which means the foam has been independently tested for safety of materials used. Our gel-infused memory foam features a breathable, advanced open-cell design to increase circulation, air can pass freely beneath your body, you will sleep more deeply and wake up feeling refreshed. SPECIFICATIONS Product Dimensions: 37.5x74x3 inch(TWIN) Available in Twin, TwinXL, Full, FullXL, Queen, King and Cal King size Smartly Shipped - Our patented technology allows our mattresses to be efficiently compressed, rolled and shipped in a box conveniently to your door. However, after receiving and unrolling the topper, maybe you will find that it is 3-4 inch short. Do not worry, because of the memory foam's own feature, the size will recover and then it will fit your bed perfectly after keeping it in ventilated place for 2 days. We offer a 5-year warranty that protects the mattress and cover against manufacturer defect. CARE INSTRUCTION Store in a Cool and Dry Area Direct away from Sunlight.